Keep water and debris contained on this 20 mil-thick vinyl mat with a 1" snap-on edge! Place a custom-fit Clean-Park Garage Mat under each vehicle in your garage, and you’ll never walk through grease, sand, salt, or slush again! All messes that are brought in from the outside by your wheels, wheel wells and undercarriage are contained by the 1” lip that runs the perimeter of your Clean-Park Mat to keep your garage floor from wet, slippery substances that may stain or, worse, cause an accident! The Clean-Park Garage Mat, available in many sizes (see below), is constructed of thick, rugged 20-mil vinyl with a specially engineered 1” high Snap-On Edge to keep liquids and debris neatly inside. Simply drive onto the mat, let your vehicle drip all that it wants; your garage floor is protected! Clean-up is easy! Remove a segment of your Snap-On Edge closest to the garage door and sweep or hose away dirt and debris. A squeegee is helpful to remove all the water. Remove and replace the Snap-On end section as needed to facilitate easy cleanup! I’d like to explain the assembly and versatility of this product. The Snap-On Edges come in 24” segments for the length and 18” segments for the width. They accommodate ALL sizes of the Clean-Park Mats. (Your order will include the appropriate amount). Once you have your mat in place, you attach the interlocking edge pieces starting with one of the special corner pieces and work your way along each side. The pieces will encircle the entire mat sealing it in, creating a barrier that holds in liquid, mud and debris. (Please click below on the manual for more details. Some restrictions apply.) It comes with a one-year limited warranty. Most four-door sedans are, bumper to bumper, 18 ft. long and 6 ft. wide. Today’s standard garages measure 20 ft. long. 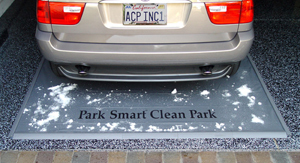 You want to choose a Park Smart Clean Mat that will give you a 6-12 inch border around the car. Should you change cars, the size isnt critical, because the wheel bases aren’t all that different. If you downsize and want a neater look than the excess mat affords, simply turn the excess under, and adjust your Snap-On Edges to accommodate the smaller size! Also, some people don’t like the logo that comes on the Clean-Park Mat. I’ve found that it works just as well if you flip the thing over! Same installation, same function, no logo! Please note: There is no additional oversized shipping added to this item. Standard shipping charges apply. Standard shipping on mats is between $17.95 - $21.95. Due to the weight of this item, when purchasing multiple mats, each mat must ship separately and be charged an individually calculated shipping rate on each carton. A sales rep will email a confirmation of these charges. *Garage Flooring Mats can only ship by Ground Service.